These 10 lessons on Apologetics will equip and encourage your students to clearly and effectively explain why they believe what they believe. And they’ll be prepared to respond to some of the worldviews they encounter, including atheism, agnosticism, Buddhism, and Islam. Lessons focus on several major themes: overview of Apologetics, understanding who Jesus is, responding to specific worldviews and explaining your faith. 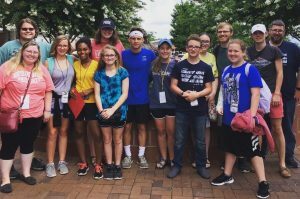 Gospel of Mark – We will read the scripture from Sunday’s message and discuss the scripture and sermon on how it can apply to our daily lives and provide the students with a challenge for the week to live out what they learned. Reserve your spot! 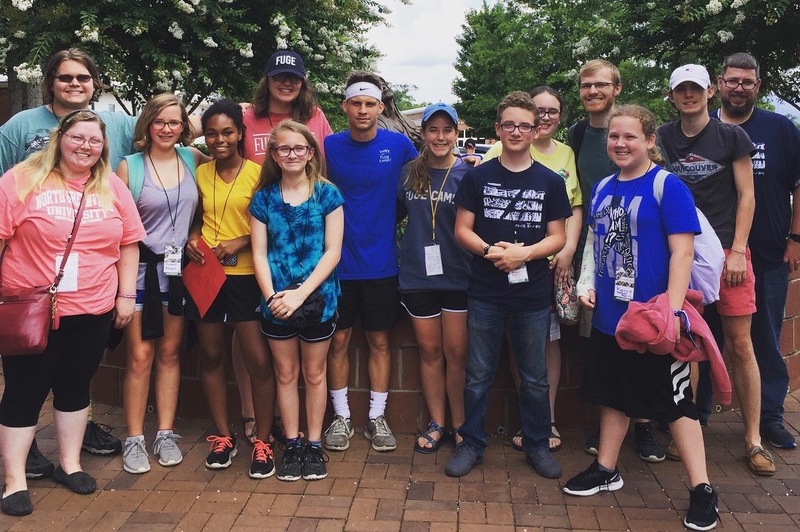 Youth who want to attend Lifeway’s M-Fuge camp in Mobile, AL will need to pay a $60 non-refundable deposit by Sunday, February 3 and RSVP online (http://www.midwaybc.net/connect/youth/). The camp dates are June 30-July 7. The cost of camp is $350. However, through the Sweetheart fundraiser dinner and Youth and Children’s Fundraiser Auction, the cost will be significantly reduced. Due to the long travel time, we will leave on Sunday, June 30th and return Sunday, July 7th. As of now, we have two male chaperones and will need at least two female chaperones. If you are interested, please see Zach (zach@midwaybc.net). All Youth and their families are invited to Zach’s Family home (17 Glencove Street, Frankfort) for the Youth Super Bowl Party from 6pm-8pm. Food and drinks provided. No formal RSVP required. The MBC Youth will host the “Sweetheart Dinner” to help cover travel costs to summer camp on Friday, February 8 at 6:30pm in the Ministry Center. The meal will feature your choice of Ribeye Steak or Grilled Chicken, salad, rolls, choice of sides and dessert. There will also be live music and door prizes. We will need Youth and parents to help with set-up and prep beginning at 4:30pm on February 8. Youth will be serving the food, assisting in the kitchen and helping Mrs. Andrea with the kids. Christian artist Toby Mac will be bringing his tour to Freedom Hall in Louisville on Saturday, February 9th. The concert will also feature Jeremy Camp, Jordan Feliz, Ryan Stevenson, We Are Messengers and Aaron Cole. We will leave from church at 4pm, have dinner in Louisville and enjoy the concert starting at 7pm. We will be arriving back late and will drop off your student directly at your house! Please bring $10 for ticket (Youth budget will cover remaining balance) and at least $15-$20 for dinner. (Optional) money for snacks, drinks or souvenirs at the concert venue. RSVP by Feb. 1 https://goo.gl/forms/CTv9hZ9rOACR9Emt2. Youth Lock-in will be 7pm Friday, March 15 to 9am Saturday, March 16. We will have games, movies, food and a variety of activities. Youth can bring up to 2 guests. Please see Zach if you’d like to help chaperone or have questions. No cost! The Youth Facebook page is designed to inform the students and parents via social media of upcoming youth events and church news. It’s a closed group and member requests will be sent to one of the administrators of page to accept your request. Erin McQueen has almost completed her project for her Girl Scout Gold Award (comparable to Eagle Scout in the Boy Scout system) and her service project to develop a community meditation garden on the grounds here at Midway Baptist Church. 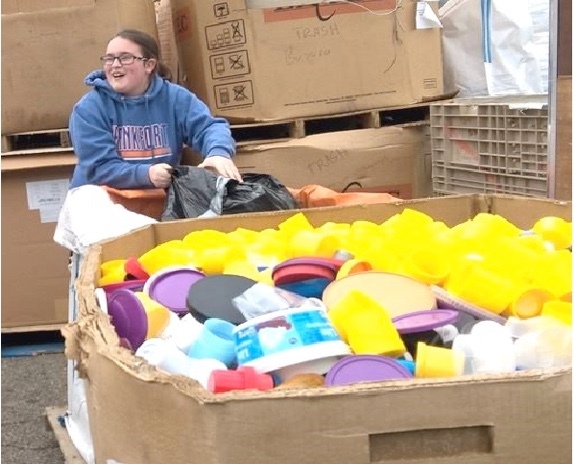 She completed her first phase which was to collect 400 pounds of plastic tops to make a bench. Erin, June Baker, and Girl Scout troop leader, Tonya Lee, (and a few others) headed to Evansville, Indiana to turn in the tops. They enjoyed the trip and were very excited to finally see the bench. Erin wants to thank Evan who was at the church and was available to lift the very heavy 187 pound bench from the trailer. The bench will be placed in the front of the church, in the area near the dogwood tree as a place for not only the church but those in the community to enjoy. Erin would like to thank Tonya and Mike Lee for driving to Indiana, Boy Scout Troop 1 for letting her use their trailer, and all who helped her collect the 400 pounds of bottle caps. Make sure you check out the garden coming soon and admire the wonderful bench.